The College Counseling Office (CCO) offers a well-developed college counseling program that includes a variety of focused events for students and families. Throughout the fall, the CCO hosts admission representatives from approximately 100 colleges and universities who visit D-E during the school day to inform our seniors about the opportunities at their institutions. 11th Grade students are welcome to attend these college information sessions as long as it does not conflict with a class. The list of visiting colleges is posted on Naviance, in the Senior Lounge, and in the College Counseling wing in Leggett Hall. 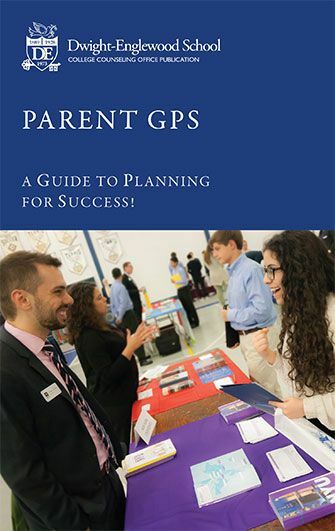 In addition, D-E is the host site for Bergen County College Information Sessions in the fall and spring which is open to students and families in and surrounding Bergen County. During the 2017-18 academic year the CCO will administer the PSAT to 11th Grade students in the fall and to 10th Grade students in the spring. For this year D-E is the test center for the October, December, and June SAT administration test dates. With over 3,000 colleges and universities in the country, the process of selecting a college can be a daunting undertaking or an opportunity to explore new possibilities. Before considering specific colleges you should assess your individual needs, strengths, goals, and values. Developing your college list is a personal decision, one that requires honest self-evaluation. Defining your priorities will make it easier for you to research and identify colleges that best match your personality and goals. There are many resources available to students and families for researching colleges and universities. The College Guidance Office strongly recommends including campus visits in your college research. Seniors are granted 4 days of excused absence and juniors 2 days of excused absences per academic year for this purpose. A campus visit is the best way to experience a college first hand. Colleges are looking to attract students who are the best match, both academically and personally for their institution. Approximately one hundred colleges visit the College Guidance Office each year. What do D-E students need to keep in mind and know about college admission standardized tests. Cost can be an important factor in selecting a college. Guidance Director to review additional information that may be required. Click here to view the 2016-17 College-Bound Student-Athlete Guide. If a student-athlete takes the current SAT before March 2016 and then takes the redesigned SAT at a later date, the NCAA Eligibility Center will not combine section scores from the current and redesigned SAT when determining the student-athlete's initial eligibility. The NCAA Eligibility Center will only combine section scores from the same version of the test. Because the redesigned SAT varies in design and measures different academic concepts than the current SAT, a numerical score on the current test may not be equivalent to the same numerical score on the redesigned test.